This procedure uses tiny needles to pierce the skin allowing new collagen to grow. This procedure uses your skin’s own natural healing ability to reduce the look of fine lines, scars and wrinkles. Microneedling is an easy, minimally invasive procedure that you can do as little or as much as you want. This procedure is perfect if you are looking to simply reduce the look of fine lines, or if you are treating scarring from acne. 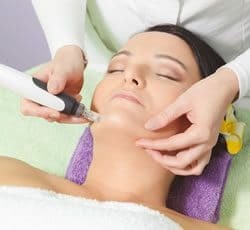 What skin conditions does microneedling improve? It is also referred to as dermarolling. It is a minimally invasive treatment that rejuvenates the skin. Your skin will become smoother and more radiant in a week. Your pore sizes will reduce and any stretch marks or acne scars will be reduced. A device with fine needles creates tiny punctures in the top layer of the skin, which triggers the body to create new collagen and elastin. The number of treatments depends on the severity of your skin condition. Many people see noticeable improvements after 1-4 treatments. If you have sensitive skin, you can apply a numbing cream to minimize pain during the treatment. How often can I repeat the procedure? You can perform a new treatment safely every 4-6 weeks. You will experience some redness and mild swelling for 2-4 days. You may even notice slight bruising or several tiny blood spots that will disappear in 24-48 hours. Do not use a chemical peel, put on makeup or spend time in the sun for several days after your treatment. This allows your skin to heal completely.